There’s no way you’ll notice it from the grandstands – andyou’d even struggle to pick it up close – but the Ford FG Falcon has sacrificeddownforce via a two degree flatter rear wing as a result of pre-season aerodynamicparity testing. And the new Holden VF Commodore is responsible. The VF has moved to a 50mm narrower endplate-mounted rearwing which has less rear downforce than the old VE. To match the Falcon's reargrip would have meant cranking on so much wing it would have resulted in asignificant loss of straight line speed. So instead the FG, which entered aero testing at the EastSale RAAF base as the benchmark – or datum – because it was the only carry-overcar, had to flatten its rear wing angle to ensure the Commodore wascompetitive. The change has resulted in the loss of about 15kg in reardownforce for the Falcon. 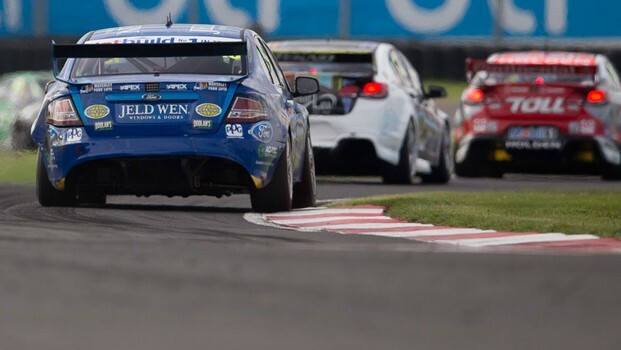 V8 Supercars Technical Manager Frank Adamson said theCommodore and Falcon were now closer in aerodynamic terms than they had everbeen, and were closely matched by the two championship newcomers, the NissanAltima and Mercedes-Benz E63 AMG. The wing wasn’t the only part of the FG’s aero package tochange as the rear undertray was also redesigned because the fuel tank has beenmoved forward as part of the Car of the Future redesign. Ford Performance Racing (FPR) Team Principal Tim Edwards saidthe aero changes had added further complexity to the set-up puzzle the team isin the process of solving with the new Car of The Future technical regulations. “Our aerodynamic package is very different to what it waslast year, we have a different rear diffuser and rear wing than we had lastyear… so the reality is we have got a different aero balance to what we hadlast year. Considering Will Davison broke through for FPR’s first winof 2013 at the ITM 400 Auckland on Sunday and leads the championship, whileMark Winterbottom has displayed sizzling pace at times, there is no doubt theteam is making development progress. However, Commodores have won eight of the nine Championshipraces run this year. Edwards couldn’t resist having a go at the Commodore aero package,which was developed by Triple Eight Race Engineering’s Ludo Lacroix inconsultation with Holden and the Holden Racing Team.